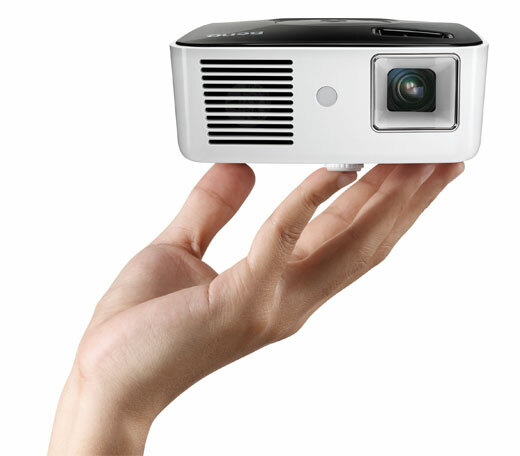 Smaller than a Mac Mini, the palm-sized projector sold me with its line-up of travel-friendly features. You can leave the laptop at home. Pop a video-loaded USB flash drive into the back socket, crank up the built-in speaker, grab a box of Milk Duds and it’s movie night no matter where you are. Better yet, you can power it off your iPod, iPhone or favorite gaming device. And forget wobbly book stacks under the projector. This puppy has a convenient tripod socket, making photo slideshows a breeze. Tripod? Who the heck carries that? Hey, I’m a travel photographer who leads photo tours. There’s ALWAYS a tripod in the house. But, the real highlights of the GP1 aren’t necessarily even travel related. I loved the fact that set up was beyond easy, even for non-techies. Forget installing drivers and reading manuals. Using the projector for the first time was a no-brainer. Once you plug-in your source – laptop, iPod, USB drive, etc. – and power it up, there’s not much else to do. From unpack to onscreen, I had the BenQ projecting amazingly vibrant 80-inch images off my MacBook Pro in less than 5-minutes. Try finding a TV that will do that under $500. NOT. Say hello to my new home theater system. The BenQ is even environmentally friendly, featuring 100% mercury-free 3LED technology, packed with recycled materials, and less than 1Wstandby power. Bottom line, this is one truly cool little gizmo. Available at www.BenQ.us + visit BenQ on YouTube. BenQ has offered a FREE 2 year extended warranty exclusive to Gadget Girl readers! But it’s a limited time offer, expiring July 31, 2009. It doesn’t matter when the GP1 was purchased as long as you enter a valid product serial number and promo code before Jul 31st.